Machine builder develops energy-saving, quiet hydraulic unit for its own equipment; quickly realizes benefits as OEM stand-alone for other machine builders, with “digital factory” control capabilities onboard MJC Engineering is a custom machine tool builder in Huntington Beach, California, specializing in metal-spinning machines for such applications as sheet spinning, flow forming, wheel spinning and rotary forging. The company’s machines are found worldwide, producing end products such as car wheels, aircraft engine housings, spacecraft fuel tanks, welding gas cylinders and more. MJC machines typically utilize very large volumes of hydraulic power in operation. About three years ago, the president at MJC, Carl Lorentzen, began investigating the configuration of the hydraulic units used on his company’s machinery. Lorentzen had a great interest in servo-pump technology, having read about its application in other industrial uses such as injection molding machines, extruders, stamping presses, offshore oil rig assemblies, cranes, lifts and other materials handling equipment. He also cited a recent incident, where MJC changed insurance carriers and, as part of the company safety audit, sound levels were tested and the hydraulic power units were a concern. Lastly, as MJC sells its machines to premier OEMs around the world, issues involving big data capture, IIOT and Industry 4.0 integration were surfacing from customers. Likewise, Lorentzen turned to his longtime supplier of CNC, PLC and drives technology, Siemens, for further assistance. A team led by Chris Britton, the Siemens sales manager for the region, assisted with various application engineering studies, energy and controls testing to affect the optimum design, all while working in concert with the MJC team. 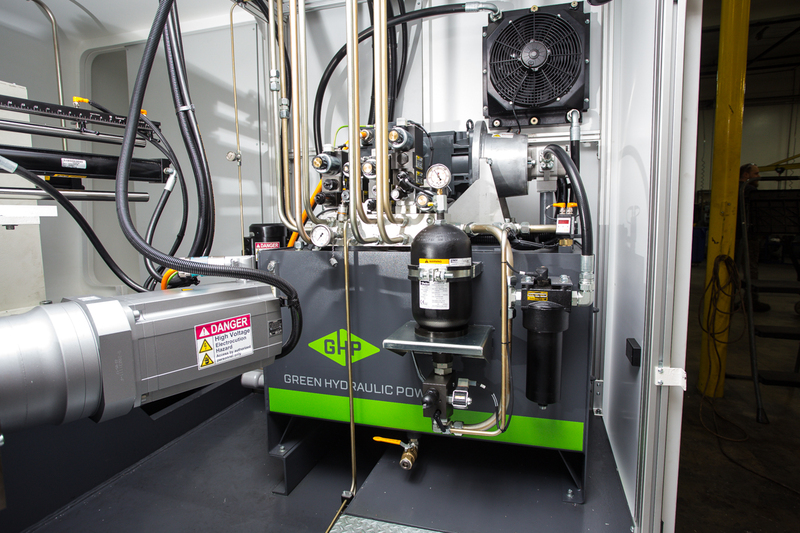 A further advantage quickly emerged, as the Green Hydraulic Power™ unit (GHP) began to take shape. Little or no external cooling was required to dissipate the ambient heat of the unit. Further, in response to the market’s movement toward digitalization, there were two aspects of note. From the OEM perspective, MJC benefitted from the conceptualization, engineering and commissioning tools offered by Siemens in the build-up of the GHP units. Sizer®, for example, orchestrated the integrated data across the entire platform of drives technology, enabling the MJC engineering team to match the most suitable products to the specific requirements of the end user applications, with a drastic reduction in the engineering time on subsequent unit designs. M-CAD likewise enabled the importing of all motor specifications to match the requirements of each job. Finally, for the end-user, the Siemens TIA Portal provides faster commissioning, increases productivity and facilitates comprehensive data capture, which benefits both operations/maintenance personnel and the integration of the data into a “digital factory” mode, as the system’s condition monitoring and diagnostics can reside in the cloud or otherwise be networked to a controls communication stream. Depending on the drives technology selected, it is also possible for the end user to perform online configuration of the drives via their web server. GKN Aerospace in Orangeburg, South Carolina was the first customer for whom an entirely new MJC spinforming machine was built, utilizing a complete and now duly named Green Hydraulic Power™ unit. MJC’s Vice-President Per Carlson and his hydraulic engineer Jerry Wang designed the unit. An already documented result of the GHP unit onboard its machine, GKN has experienced nearly a 70% energy consumption savings, plus the quieter operation and smaller footprint. Following this development, Lorentzen had another, more profound revelatory moment. He realized the unit could easily be adapted onto any type of heavy hydraulic piece of equipment. Subsequently, he established Green Hydraulic Power, Inc., which today functions as a free-standing enterprise. From the Siemens side, this development has resulted in additional business from MJC and, as a result, a cooperative marketing venture has taken shape, with funding provided to promote the green impact of the unit. Over a dozen MJC machines with GHP units have been built and installed to date (November,2017) with no issues reported. Lorentzen cites the extended warranty on the Siemens components, which constitute the majority of those used on the GHP, as a further upside. 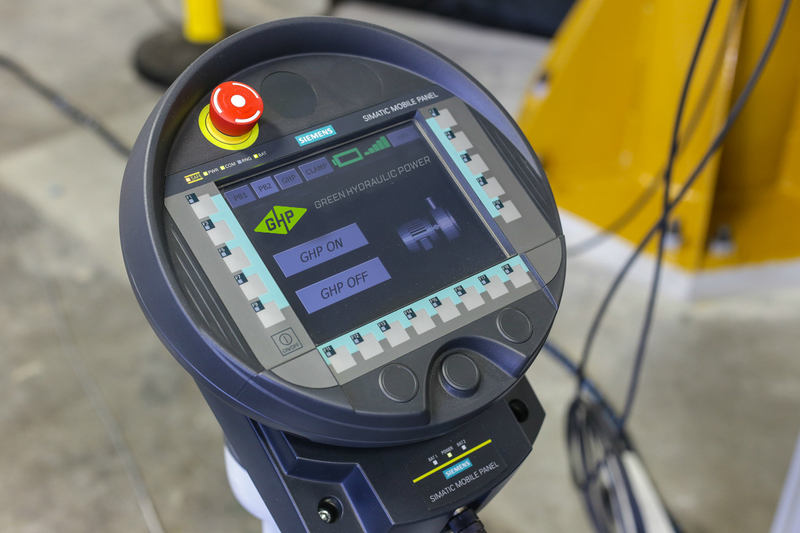 Further options under development for GHP include Siemens Scalance wireless control, kW torque setpoint on pressure, fail-safe compatibility, custom touchscreen and other monitoring and maintenance tools for operation and unit data transmission in an Industry 4.0 environment, over a Profinet industrial Ethernet protocol. When equipped with the high-level Safety Integrated PLC from Siemens and other required components, the GHP is suitable for severe environments such as oil rigs, chemical processing equipment and other challenging work environment applications. Lorentzen states the GHP is now available for sale or on a lease option. MJC Engineering & Technology, Inc. was founded in 1994 in Huntington Beach, California in response to the lack of service and support within the CNC Metal spinning machine markets. Their goal was and remains, to service and support our customers with their custom-built CNC metal spinning equipment. For more information, visit www.mjcengineering.com. 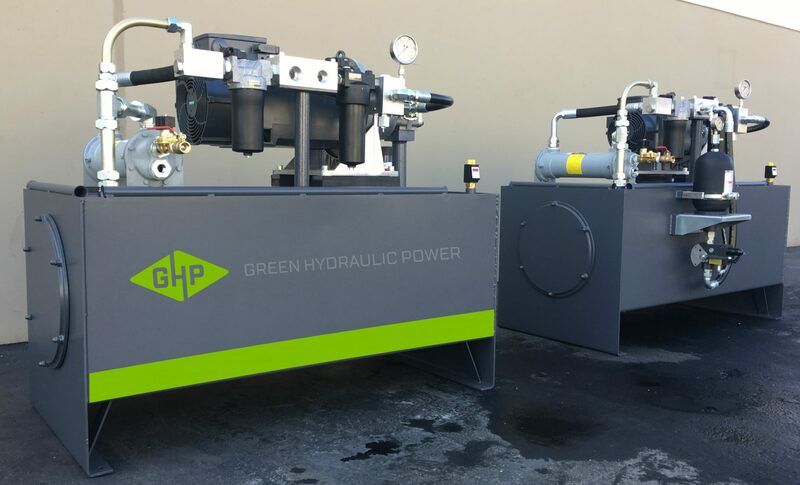 The innovative and experienced team of Green Hydraulic Power has been developing and integrating hydraulic power units with Variable Frequency Drive technology. 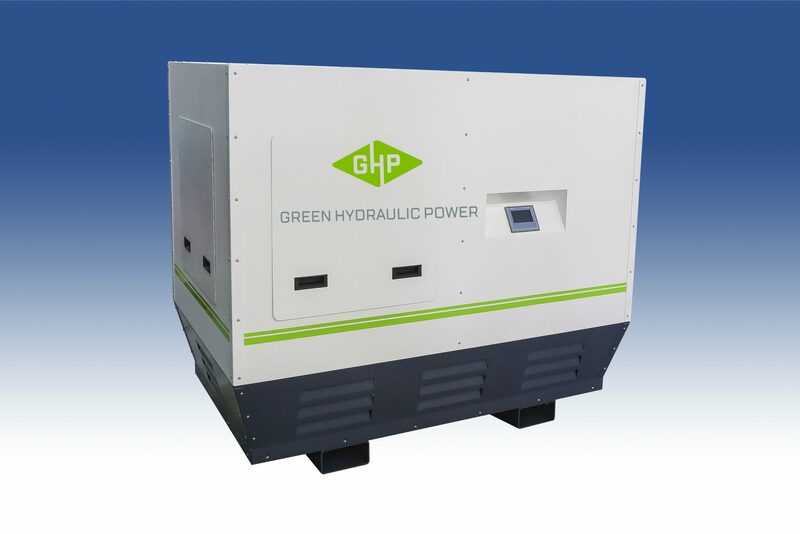 GHP units represent trusted technology in an inventive package, offering enormous energy savings, limitless compatibility, and unprecedented affordability in the manufacturing industry all around the globe. 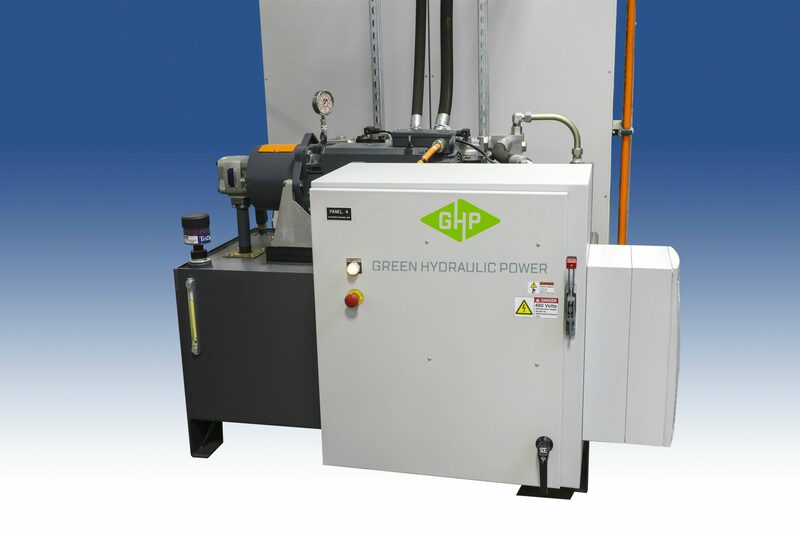 For more information, visit www.greenhydraulicpower.com.